I ran into Breffo at CES 2012 and CES 2013. I had the recent opportunity to test and review the Breffo Spiderpodium’s the little one for phones and the larger one for tablets. To put it mildly I was impressed by their design, ease of use, versatility and how fun they are!! It is a quick and simple user friendly stand and much more. Designed with today’s portable handheld consumer electronics in mind, the ‘take it everywhere, use it anywhere’ Spiderpodium portable dock & podium is a universal, multi-purpose, gadget grip, holster, dock and display podium which is compatible with most all compact handheld devices including smartphones, portable phones, portable movie players, mp3/4 players, gaming systems, SatNav’s, camcorders, portable projectors, compact camera’s, e-readers and more! They are efficient, and can be used for phones, tablets, cameras, gps devices, and mp3 player. They are easy to take with you such as in a camera bag or laptop case. 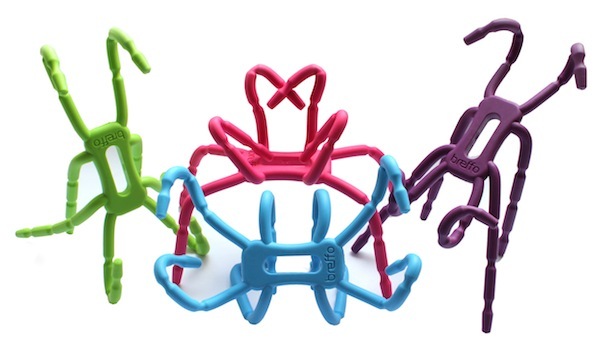 They are flexible and can be manipulated to work with a variety of devices and on a many surfaces as well. The amazing and versatile breffo holders!! 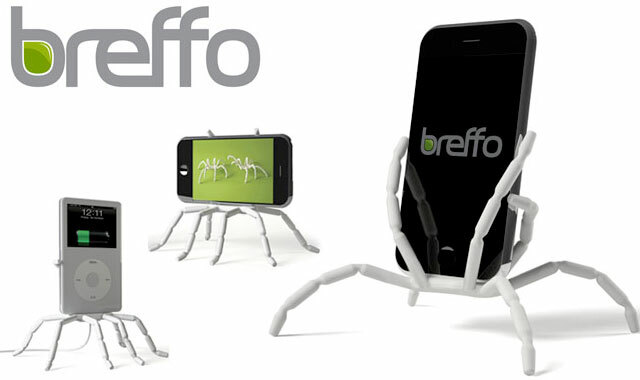 The Breffo Spiderpodium tablet and smaller device holders are fun as well. They look like spiders, and since I work for Orkin in commercial sales they are fun for us to show customers. My twin almost 17 year old sons also love them. My wife however does not want them any where near the dinner table since she has a fear of spiders which can be fun in itself as well. As seen in the following image, they come in a variety of colors to suit the user’s preference. They come in 2 basic sizes, one for smaller objects. I used that one with my old Sony Xperia ION, and my new Samsung Galaxy S3 and my daughter’s ipod touch and they worked well for all devices. The ipod touch was a bit small but the Breffo Spiderpodium worked well for it as well. I also tested the larger model for tablets and was impressed with it too. I used the larger one with my Apple Ipad Mini, and HTC View 4g and it worked well. Breffo might want to consider a larger one for the larger android tablets as well. The breffo tablet spiderpodium worked well with my Ipad Mini, and My co-workers ipad as well. I did not review the new one that just came out for cameras specifically but it appears to be quite nice as well. One thing that could improve the product is some type of suction cup on the end of the spiderprodium for use on shiny surfaces like glass tables but other than that they are very nicely design and fun as well. A variety of colors and 2 sizes. In testing we found that the Spiderpodium Tablet was an excellent tool and it worked well for Android and Appple tablets as well as phones, after we go a handle on how to use the spiderpodium manipulate it’s arms properly it worked quite well. It could also be helpfull to hold up a book, or portable dvd player or a mirror in a beauty shop as long as it does not scare the users. I would definitely recommend it to anyone who needs to have hands free access to a device for watching a movie, reading a book or doing a presentation!! The Breffo Spiderpodium can also be used for holding a tablet to the back of a car’s head rest so the people in the back seat can watch movies too. There are tons of uses for the exciting Breffo Spiderpodiums!! 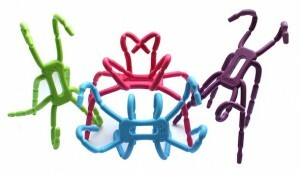 Be the first to comment on "Breffo Spiderpodium an exciting and versatile product from the UK"